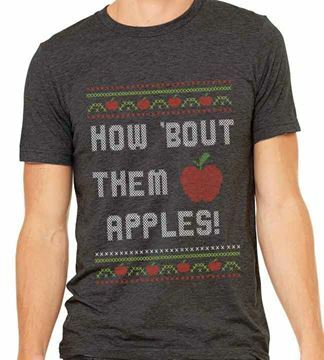 How 'bout them apples, is just the shirt to say I told you so. These tri-blend shirts are comfortable with a relaxed fit that make for a great everyday favorite t-shirt! Made of 50% polyester, 25% combed ringspun cotton and 25% rayon. The mustache is trendy right now, so I mustache you a question. Do you want this cool shirt? And if you really have to ask what this means, you don't understand anyway. Made from 50% polyester, 25% combed and ringspun cotton and 25% rayon. Have a party to go to and you can't find that "Ugly Christmas Sweater"? No fear, get one of our fabulous t-shirts and you will be the life of the party. You will not only be comfortable (I know how hot is gets in sweaters on the west coast during Christmas) but fashionable too. These are not just for the holiday party fad, but they are for EVERYDAY. Be part of the cool crowd (literally) or just be a nerd like the rest of us! Copyright © 2019 Ugly Sweater T-Shirt Company . All rights reserved.